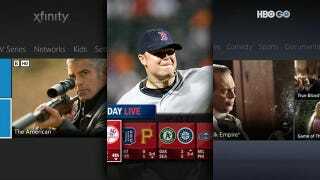 Today Microsoft further entrenched the Xbox 360 as the best alternative to a cable box with three new Kinect-capable video apps including on-demand content from Comcast, HBO GO, and MLB.TV. Comcast's Xfinity TV is the first time the cable TV giant has made its on-demand content available through a console. And as we reported yesterday, streaming Comcast content through your Xbox 360 won't actually count against your monthly data cap if the company provides your internet service as well. Makes you feel all sorts of conflicted about net neutrality.